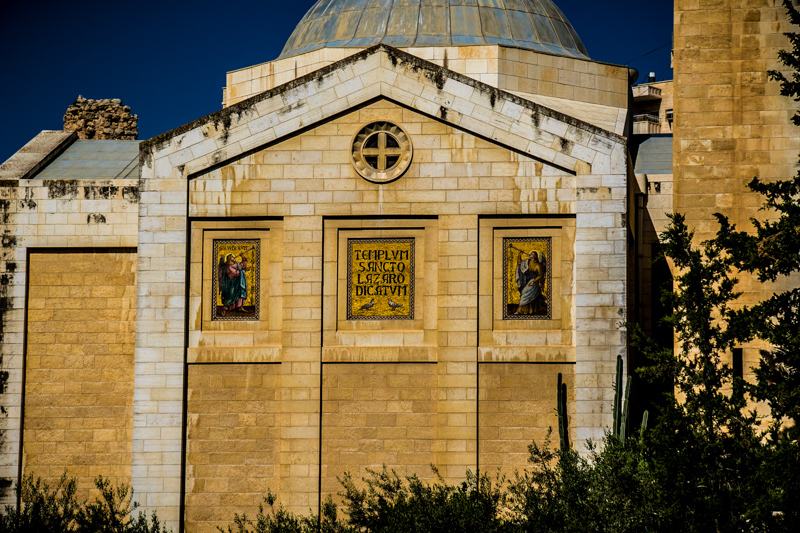 Overshadowed by the beautiful Dormition Abbey, we stood next to the building built over the foundations of the first century house where Jesus and the disciples celebrated the Passover meal in Jesus' last supper with them. We visited and worshiped in the reconstructed Upper Room, recalling all the amazing events that took place in this one spot! 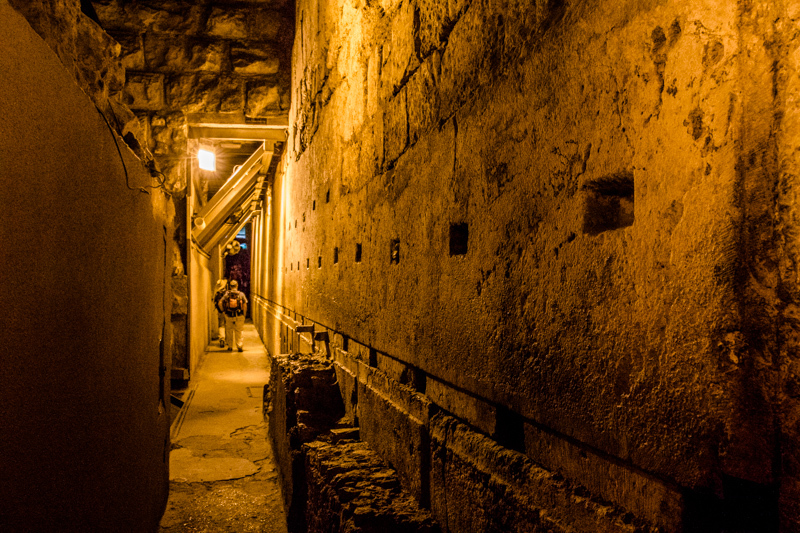 We retraced the route Jesus and the disciples took that night through the Kidron Valley and past these monumental Hasmonean tombs from the century before Jesus. 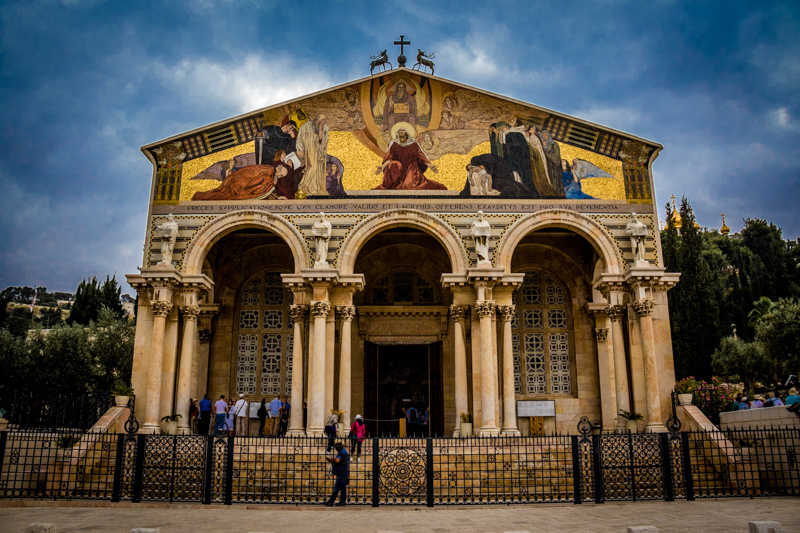 This beautiful Church of All Nations stands next to an ancient grove of olive trees known as Gethsemane at the base of the Mount of Olives. We spent some time reflecting on Jesus' powerful prayer in this awesome church which recreates that night scene in the Garden of Gethsemane. We visited this first century cave near the Garden of Gethsemane which may have been where the other disciples were left sleeping while Jesus went off with three of the disciples to pray. 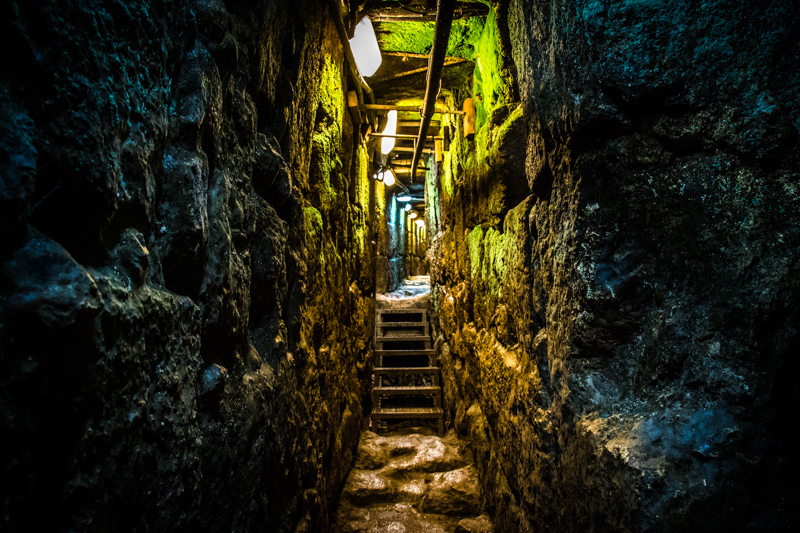 We returned to the city to visit the church that commemorates Jesus' sham trial before the religious authorities and saw the first-century stepped street that has been preserved there. We finished our day with yet another delicious shewarma lunch, this time on a rooftop in the Old City, overlooking the ancient Muristan Market. 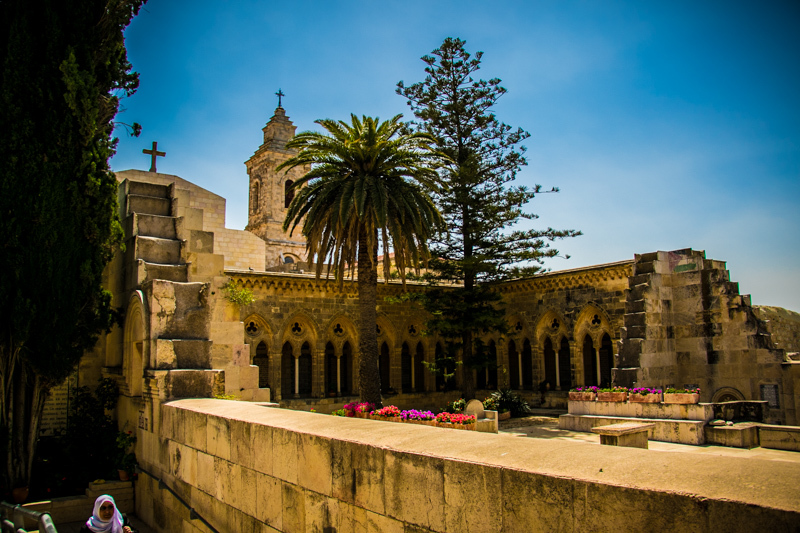 When Jesus left his hometown of Nazareth, stinging from the rejection of his village and his extended family, he went straight to Capernaum, a fishing center on the north shore of the Sea of Galilee. 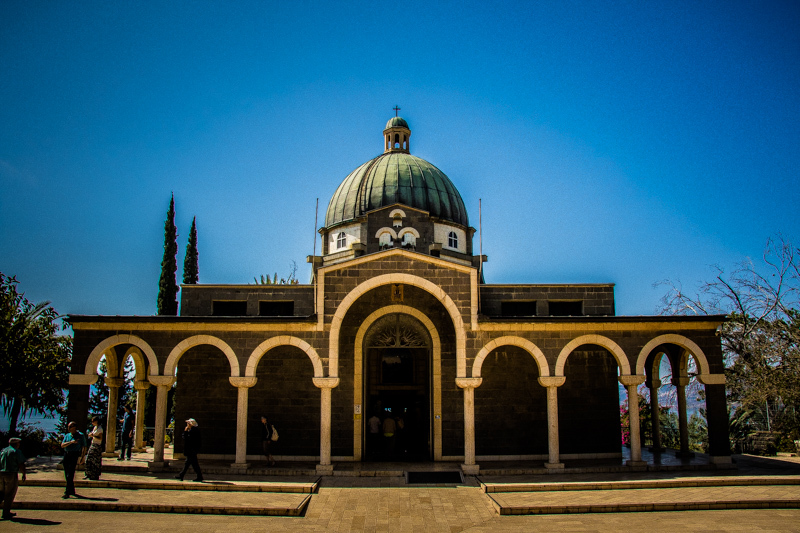 Earlier, at the time of his baptism in Judea, Jesus had met five men who lived in Capernaum. Because they seemed to be particularly open to him, Jesus decided to go to their town and see if these guys would become not just friends, but followers who would build a new kind of family with him. So we too went to Capernaum and had the amazing opportunity to see the remains of the synagogue where Jesus preached and healed, as well as the home of the extended family of Simon and Andrew where Jesus lived and redefined what a family is meant to be. As we studied the layout of the house and how it illuminates the various Gospel accounts of what happened there, we started to see the profound implications for our own family life and the mission God has called each of us to as well. 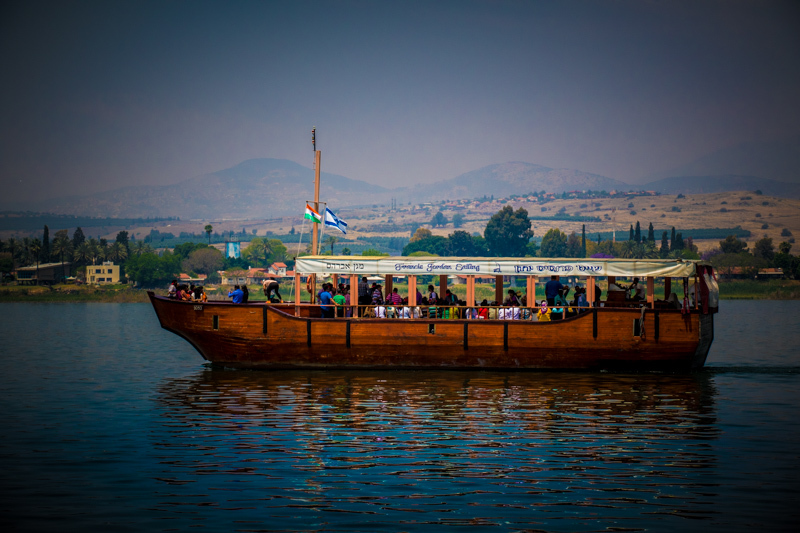 After a time of worship and reflection there by the lake in Capernaum, we headed out for a boat cruise on the lake to see things from the perspective of the fishermen who became the core of Jesus' spiritual family. 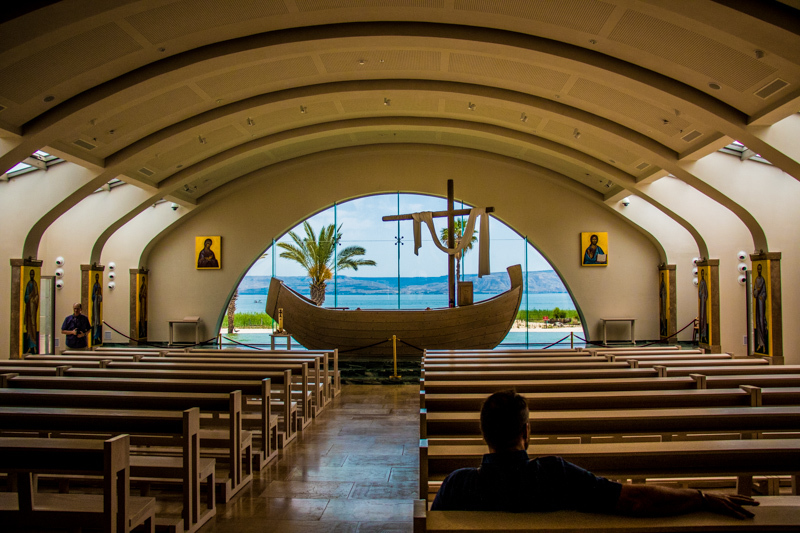 Our cruise ended with a visit to see the first-century boat discovered on the shores of the lake just 30 years ago, exactly the kind of boat Jesus and the disciples used here. This day of amazing experiences challenged us to ask ourselves if we are building the same kind of extended spiritual family on mission that Jesus did. Sitting outside the beautiful white limestone synagogue in Capernaum we could see the foundations of the first-century black basalt stone synagogue in which Jesus taught and cast out demons with authority. Looking south from the Synagogue we could see the layout of the streets and extended family homes of Capernaum at the time of Jesus, including the actual home of Simon and Andrew's oikos (extended family) which became Jesus' spiritual family. Our cruise on the lake helped us to see this land from a fisherman's perspective. From the boat we could see nearly all of the places where Jesus ministered around the north end of the Sea of Galilee. The remains of this 27 foot-long fishing boat date to precisely the time of Jesus and is exactly the type of boat that his disciples would have used to travel around the lake. 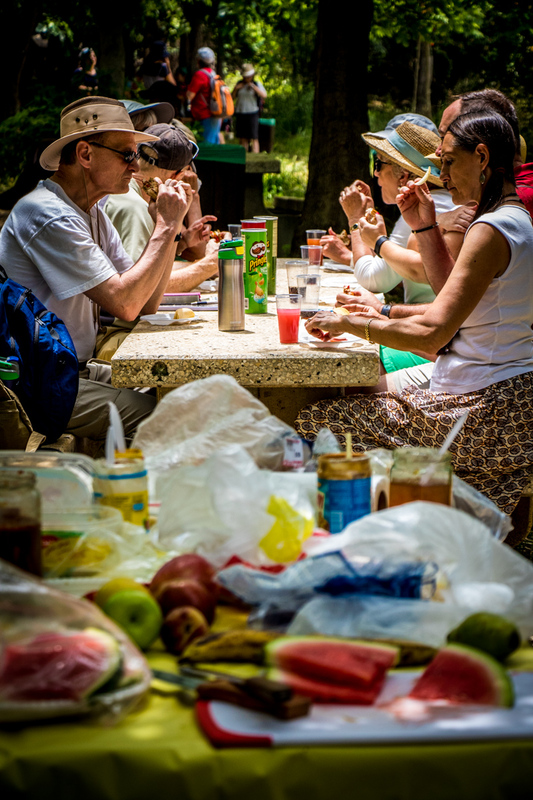 After a full morning we enjoyed yet another delicious picnic lunch with the most amazing view! In the afternoon some of us made an extra visit to the ancient synagogue of Arbel and made some fascinating discoveries. After five days spent exploring Jerusalem, the Dead Sea, Bethlehem, the Jordan River, and the Judean Desert, we said our goodbyes to the Holy City and headed north to Jesus' hometown in Galilee. Nazareth is a bustling Palestinian Christian city today, but was a small, insignificant Jewish village while Jesus was growing up there. When Jesus returned home after his baptism and testing in the desert, not only did the people of his village reject his vision of God's promise for all people, but even his extended family refused to stand with him. It was amazing to see the archaeological remains of first century Nazareth under the beautiful modern Church of the Annunciation and then to see the historically accurate reconstruction of daily life in the time of Jesus at Nazareth Village. After taking in the vistas of the Jezreel Valley from Mount Precipice and pondering the meaning of Jesus' rejection in Nazareth, we went to visit the impressive ruins and mosaics excavated at the nearby cosmopolitan city of Sepphoris, where Jesus and his extended family would have worked as builders. 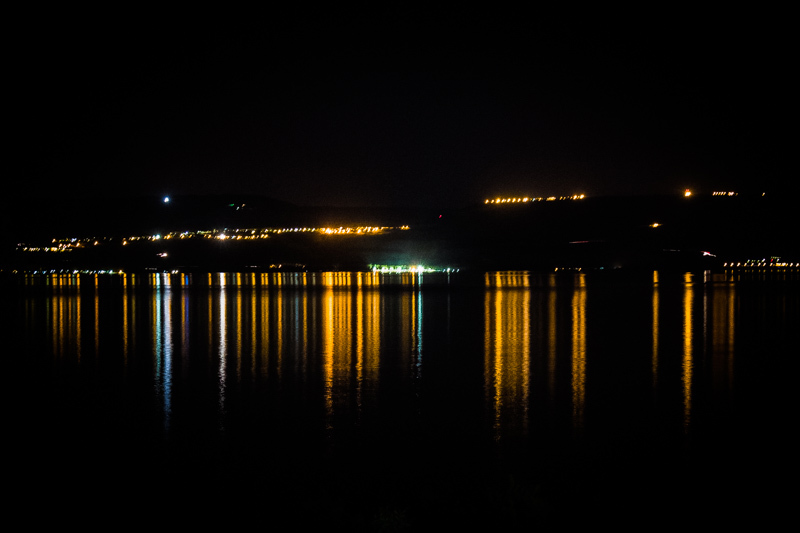 Heading north and east we crested the ridge of Arbel and were greeted with sweeping views of the beautiful lake we call the Sea of Galilee, which will be our home for the next four days! We left Jerusalem for Galilee this morning. Our first stop was the Church of the Annunciation in Nazareth. Inside the church, they have preserved the home of Jesus' family. Then we visited Nazareth Village, a reconstructed version of the Nazareth that Jesus would have grown up in. At Nazareth Village they do everything in the method of the first century, including farming, raising livestock, woodwork, winemaking, and even weaving! Then for lunch we went to a nearby vista that looks over both the Jezreel Valley and the city of Nazareth. After lunch, we headed to Sepphoris, a town that was built during Jesus childhood. He and his father and brothers likley worked here as stone masons. This is the most finely crafted ancient mosaic in all of Israel. 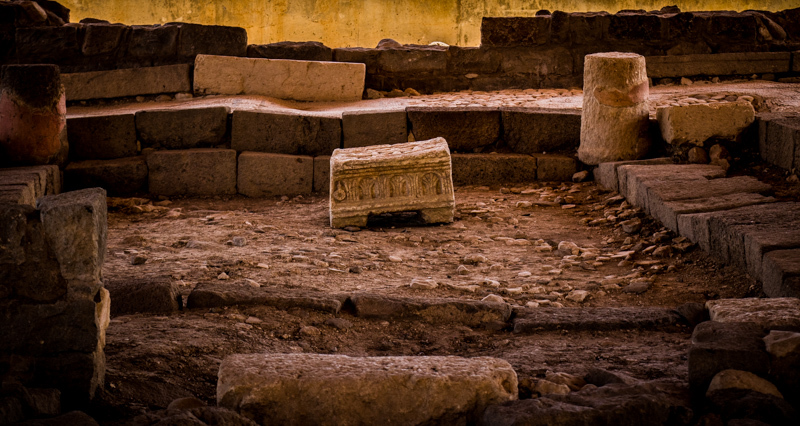 Located in Sepphoris, it is known as the "Mona Lisa of Galilee." Our journey in the Footsteps of Jesus continued today as we visited the places where two crucial events took place which launched Jesus from obscurity to the center of the public stage: his baptism by John in the Jordan River and his time of testing in the nearby desert wilderness. We visited the traditional site of Jesus' baptism just outside of Jericho and reflected on the powerful statement of Covenant identity the Father gave as he poured out his Spirit on Jesus. We had an opportunity to get into the river and reflect on the meaning of our own baptisms in this special place. Then we headed west into the forbidding Judean desert and hiked to the ancient Monastery of St George, which clings to the cliffs of the Wadi Qelt in the region where Jesus spent his forty days of fasting. After a vigorous hike and a visit with the hospitable monks of St. George's, we moved to a breath-taking desert overlook for lunch and a time of worship. As we gazed out over the desert where Jesus wrestled with the devil himself and came out victorious, we considered what it means to engage in our own spiritual battles by exercising the authority given to us as sons and daughters of the King. As if all this weren't enough, we topped off the day with a visit off-the beaten path to the ruins of Herod's winter palace outside of Jericho. It was a joy to celebrate with Margie, our new friend from Australia, as she renewed her baptismal Covenant in the very place where Jesus was baptized! Our hike down into the dramatic Wadi Qelt led us to the fascinating Monastery of St. George and the countless hermit cells built into caves in the surrounding cliffs. For over 1500 years the monks of St. George's have retreated to this place of solitude and significance to seek God and engage in the same kind of spiritual warfare which Jesus carried out in this very valley. When the Gospels refer to John and Jesus going "into the wilderness," it is not a pine covered mountain as I so often pictured, but rather this desolate and harsh desert wasteland where only the hardiest souls can survive! We enjoyed lunch while taking in the desert panorama, got to hang out with an elderly Bedouin, and then had a time of worship in which we reflected on the authority Jesus exercised in his time of testing in this desert. To finish off our day we drove to the outlet of Wadi Qelt, near the ancient city of Jericho, to explore the abandoned ruins of Herod's opulent Winter Palace which is now hidden in the midst of humble farmers' fields. Today we dug further into the world into which Jesus came by exploring two key sites along the Dead Sea occupied by the Essenes and the Zealots, Qumran and Masada. The Essenes were the Jewish separatists of the first century who tried to prepare the way for the coming of two Messiahs (!) by pursuing a strict communal lifestyle of ritual purity in the desert. The Zealots were the Jewish nationalists of the first century, seeking to overthrow the Roman oppressors through violence and insurgency. As we explored these amazing sites we were struck by the fact that Jesus was the true revolutionary who changed the world, not by withdrawing from it or imposing himself on it, but by laying down his life. We started the day at Qumran, the ancient community that wrote the Dead Sea Scrolls. A group called the Essenes secluded themselves here, and dedicated their time to copying Scripture, giving us a huge cache of ancient writings when they were discovered in nearby caves. Here, you can see Qumran in its regional setting near the Dead Sea. Then we ventured up to Masada, one of King Herod's desert fortresses. Its location high on the top of a mountain with sheer cliffs on all sides makes it a truly formidable defensive stronghold. We learned about and saw in person the stages of construction, habitation, and attack at this famous site. To keep Masada supplied in such an arid climate, these enormous cisterns were used to store water. After that, we headed down to the Dead Sea. The lowest place on earth, it is made famous by its extremely high salt and mineral content. When you wade in, you begin to float because the water is so dense. It was a refreshing end to a hot sunny day in the desert. We have enjoyed a tasty dinner back in Jerusalem, and are looking forward to tomorrow! 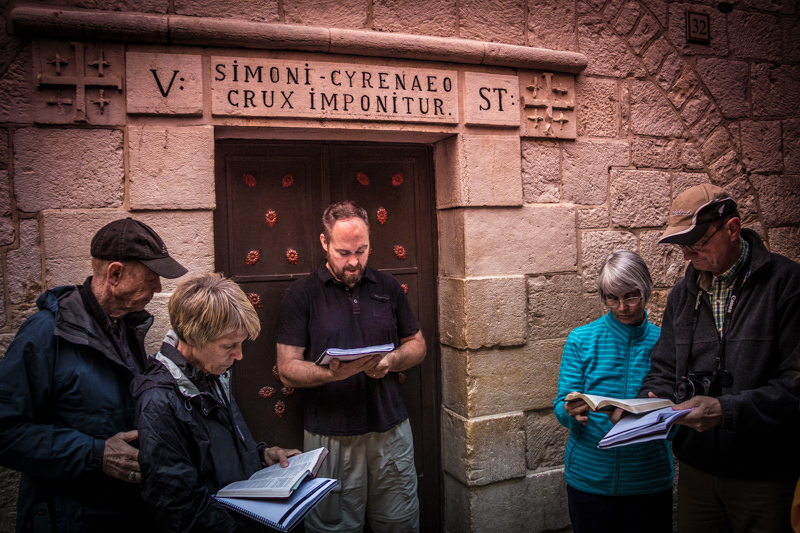 It is always an exciting and sometimes intimidating prospect to travel halfway around the globe to meet up with people from different countries and continents and pursue a spiritual journey that followers of Jesus for two thousand years have spent fortunes and risked their lives to undertake: walking in the historical footsteps of Jesus. Thankfully the cost and challenge of such a pilgrimage have been greatly reduced in modern times, but it is still quite a trip! And so it was with gratitude that every person in our group gathered in the spacious lounge of the Lutheran Guesthouse tonight to get to know each other and begin this spiritual adventure. A few of us who arrived last night had a chance to do some exploring earlier in the day ... here are a few shots from Day One as our adventure begins! We left LAX on Thursday around 6pm. We arrived in Istanbul, Turkey, around 13 hours later, and immediately boarded our flight to Tel Aviv, Israel. How many movies can you watch in one sitting? As we arrived in Israel on Friday night, the excitement was building! We landed, cleared customs, and met with our new Australian friend Margie in the airport. After tracking down the lady who mistakenly took Amy's bag, it was about an hour taxi ride into the ancient Old City, where we checked in to our hotels within the walled city and were finally able to sleep! This morning, the weather was great! We have a gorgeous view of the Dome of the Rock on the Temple Mount from where we stay. The guest house where our rooms are is a beautiful stone building with an expansive garden and patio area with stunning views of the city (and Amy!). 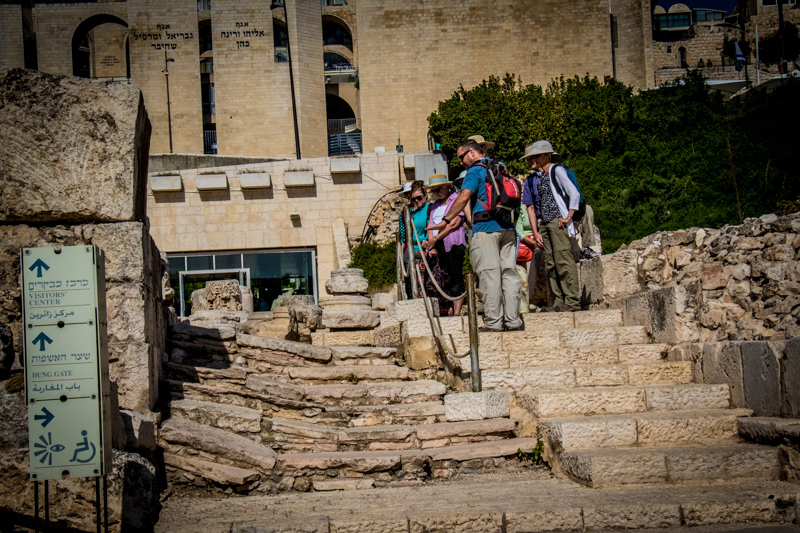 We walked along the city walls to get an overview of Jerusalem. This picture is from the top of Damascus Gate looking south into the Old City. After that, we checked out Solomon's Quarry, an underground limestone quarry that goes underneath the Old City itself. 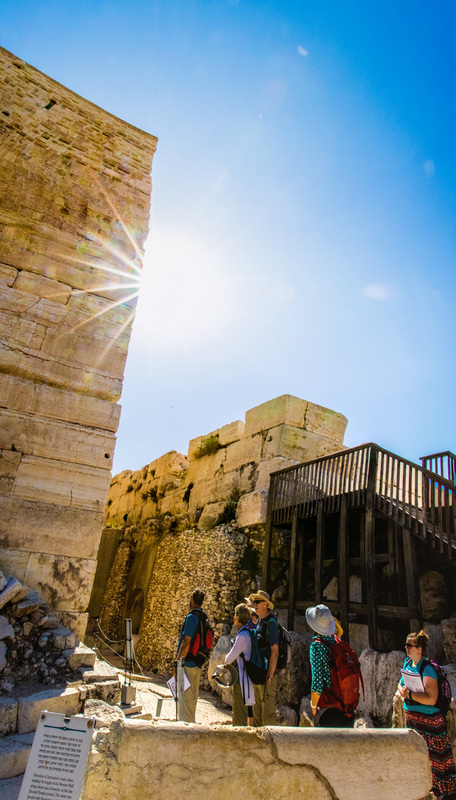 It is amazing to see what was removed to build and rebuild the great Temple of Jerusalem. By dinnertime all the members of our group had assembled and we enjoyed a delicious dinner together at the Lutheran Guesthouse, our unique accommodations inside the ancient walls of Jerusalem. After dinner we had a chance to begin exploring the ancient city of Jerusalem together with a visit to the Church of the Holy Sepulcher, which marks the site of Jesus' death and resurrection, and the Western Wall of Herod's great Temple Mount. We are hoping for a good night's sleep as our body clocks adjust to as much as a ten-hour time difference. We will need all our energy for tomorrow as we begin exploring the world into which Jesus was born. Thanks for your prayers. Please post comments and check back daily! As we have been following Jesus through the final events of his life on earth, we get a growing sense that our unique journey in this amazing place is also drawing to a close. Today we reflected on the Last Supper Jesus shared with the disciples before his arrest and crucifixion by visiting the Upper Room. 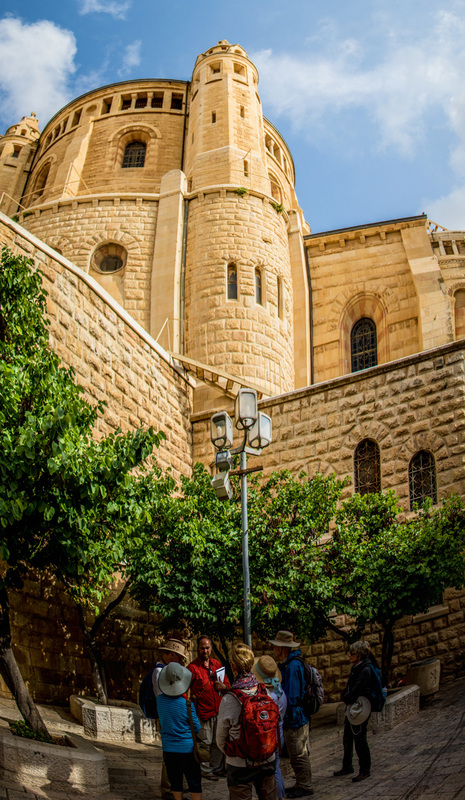 This medieval structure has been built over the ruins of two churches which in turn were built over a large first century house in this southwest part of ancient Jerusalem. This was the area where the wealthy upper class lived. 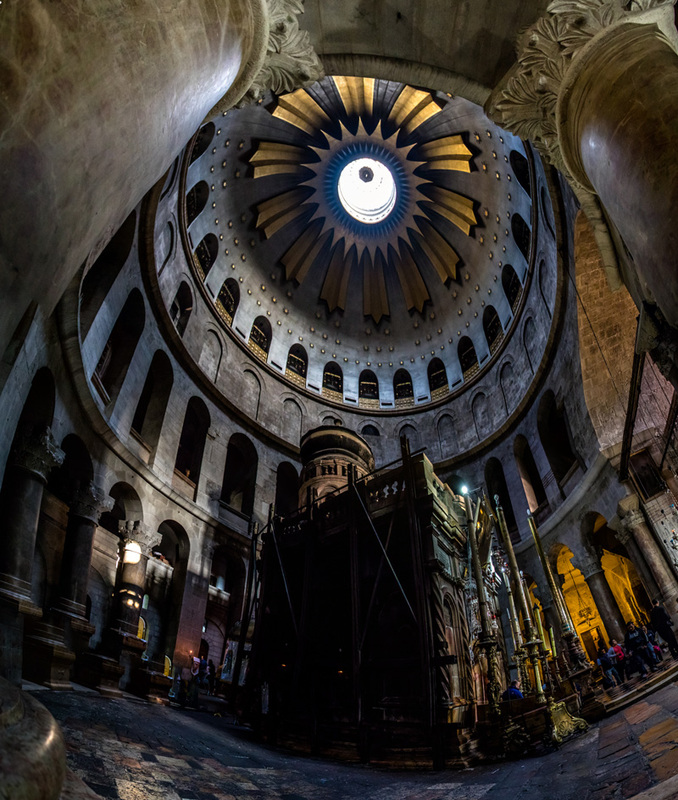 Archaeology and ancient tradition both point to this being the location of the house of John Mark, his mother Mary, and their extended family. It was amazing to realize that this was not only the location of the Last Supper, but also where the disciples gathered on the Day of Pentecost to be filled with the Holy Spirit! We sang and prayed that God would feed us and fill us with his Holy presence as he did those first disciples. 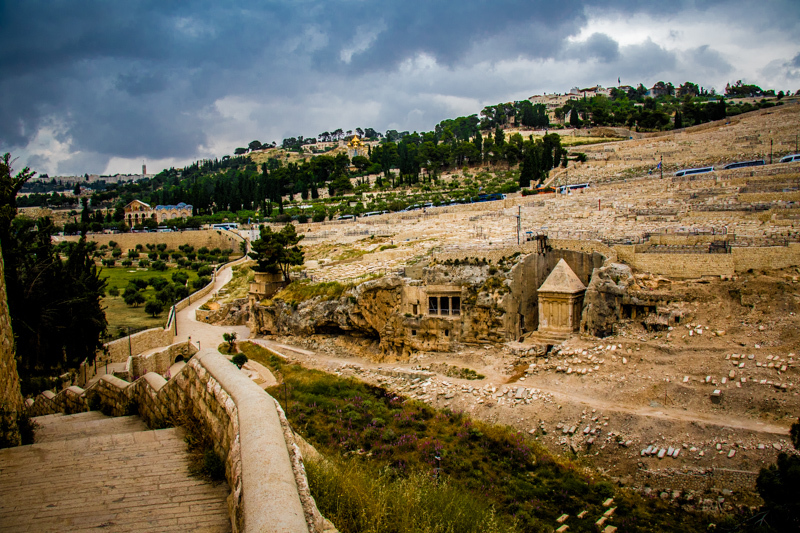 From the highest point in Jerusalem we took the route Jesus and his disciples followed as they made their way into the Kidron Valley heading toward the Garden of Gethsemane on the Mount of Olives. It was along this way that Jesus gave the disciples some of his most powerful teaching, including the image of him as the vine and us as the branches. We decided there must have been vineyards planted on these slopes which Jesus used as visual aids for this amazing teaching! 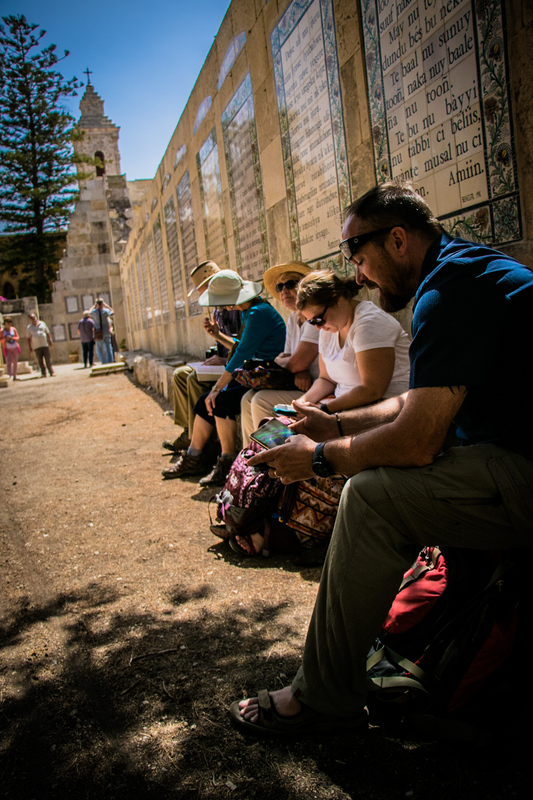 As we ascended the base of the Mount of Olives we came to the ancient Garden of Gethsemane. The monks here have tended these olives trees for hundreds of years. Gethsemane means "Olive Press" and indeed archaeologists have discovered first-century olive presses in the nearby caves of this area. It is a fitting setting to imagine Jesus under tremendous pressure as he faced his impending suffering and death. Beside the ancient grove of olives trees stands a beautiful church designed to recreated the setting of the Garden of Gethsmane at night while Jesus was praying to relinquish his will to the Father's. Each of the columns mimics the trunk of an olive tree and the mosaic dome depicts the branches of the trees with the starry night sky beyond. The purple windows create a sense of twilight and all point toward the huge rock on which an ancient tradition says Jesus prayed. 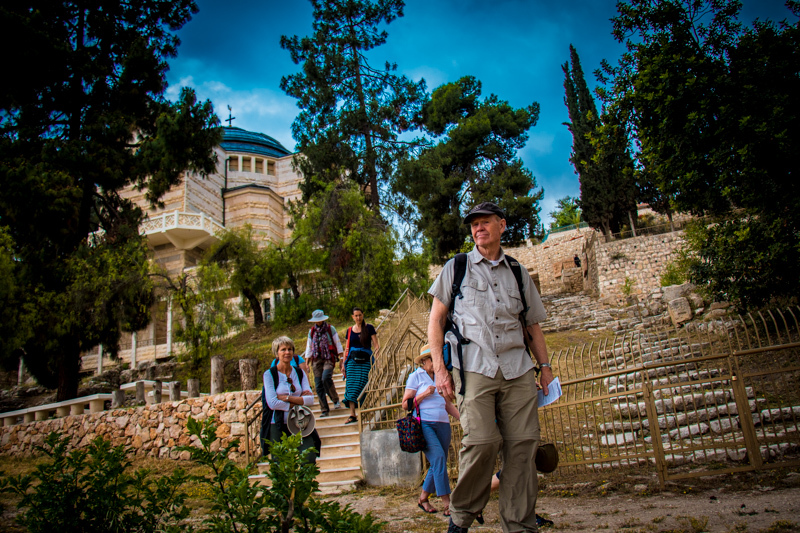 After reflecting on Jesus' humanity as an example of ultimate submission for us to follow, we headed back the way we came down the Kidron Valley, retracing the path Jesus would have been taken by the soldiers who arrested him on behalf of the religious leaders. This route took us back to the southwest hill of Jerusalem to the ancient remains of another upper class house in this neighborhood. 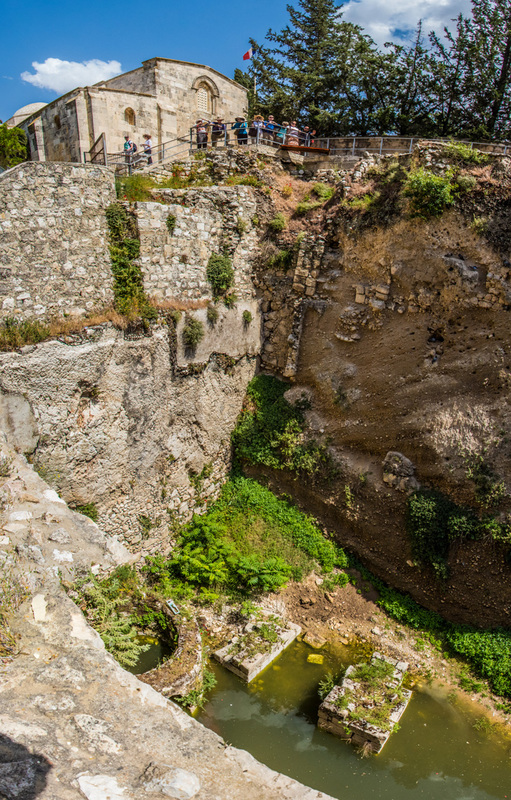 Although archaeology can't confirm this as the exact spot, the Armenian Orthodox House of Caiaphas is certainly located in the very same area where the High Priest called together certain members of the Sanhedrin to condemn Jesus in a sham trial. As we sought shade in the arches of this courtyard we couldn't help but identify with Peter who stood in a courtyard in this very area and denied Jesus three times just as his Rabbi foretold he would. On our way back the Guesthouse for lunch we paused at the site of Herod the Great's huge palace to reflect on the trial of Jesus before the Roman Governor Pontius Pilate who would have been staying there for the Passover. After lunch we got in some much-needed shopping and then returned to the Lutheran Guesthouse for a wonderful Seder Dinner recounting Jesus Last Supper. The wonderful staff here put on all the trimmings for us and served delicious lamb! After the meal we sang worship songs and shared Communion with each other. We ended the night by sharing with one another the deep love that has developed among us in just two intense weeks. We all agree that we have become a spiritual family following Jesus together! We headed off to bed to get some sleep before our 5:30 AM walk on the Via Dolorosa tomorrow morning ... hard to believe it will be our last day on this incredible journey! 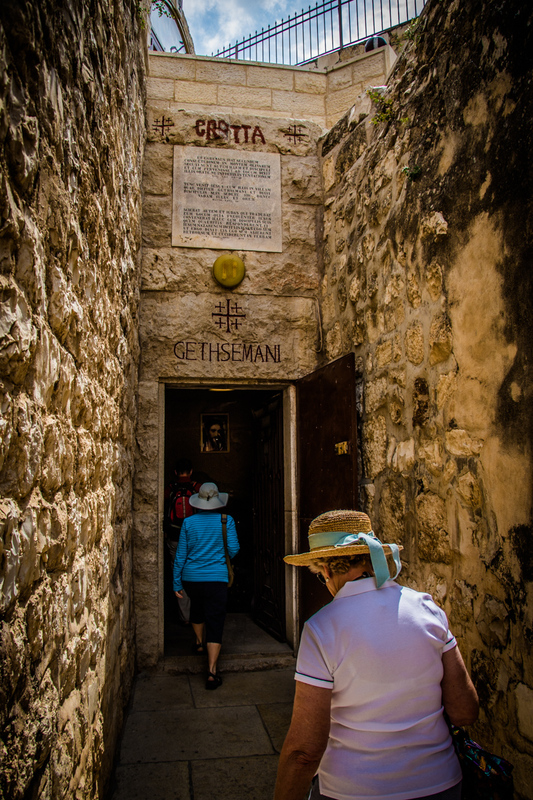 This morning we headed out to Bethany, home to Mary, Martha, and Lazarus, Jesus' closest friends in Jerusalem. We used to walk over the Mount of Olives to this little village, but now the Israeli Separation Wall makes that impossible and we have to drive for miles to get around the wall. Sadly, this means the people of Bethany are even more impoverished than before because hardly any visitors make the effort to get there. We visited the lovely modern church that is built over the ruins of two ancient churches which commemorate the things Jesus did in this village. On each of the four apses there is a beautiful mosaic depicting Mary sitting at Jesus feet while Martha worries, Mary anointing Jesus with expensive perfume, Jesus raising Lazarus from the grave, and Jesus telling Martha he is the resurrection and the life. We sang a couple of songs in this acoustically live church, followed by reading, reflecting, and praying as we do at most sites. No trip to Bethany is complete without climbing down into the tomb of Lazarus and calling each other to "Come out" of the tomb! We don't know for sure if this is the actual tomb, but we do know this is the cemetery where he was buried. It is amazing to realize Jesus' authority and power over death has been given to us as well! After departing Bethany we drove back around the wall to the top of the Mount of Olives to remember Jesus' dramatic entry into Jerusalem with his disciples. He seemed to intentionally set it up so he could fulfill the prophecies about the coming of the Messiah King to Jerusalem as a public announcement of his true identity. Of course Jesus' Kingship was radically different from the people who were shouting "Hosanna" which is why Malcolm explained we should call it Jesus' "Ironic Entry" rather than his "Triumphal Entry"! We decided it was time to record the "beautiful feet" that have been walking in the Footsteps of Jesus! Everyone has been amazing with all the walking and climbing of stairs and hills we have been doing. After lunch we went to explore the site of the Pools of Bethesda. These twin huge water storage pools built by Herod the Great were fed by a long-distance aqueduct and supplied water for the Temple rituals. It had become a pagan healing shrine at the time of Jesus which explains why so many sick and lame people were gathered there looking for healing as recorded in John 5. Jesus went there and showed amazing mercy to a paralyzed man who couldn't even say what he wanted. We reflected on God's unconditional grace to meet us where we are. On our way back to the Guesthouse we threaded our way through the crowded market street (Suq) of the Old City and stopped to by some traditional Middle Eastern sweets for our late afternoon wine party. It's not all hard work on this pilgrimage! Today we said good by to the beautiful Sea of Galilee and headed north as we explored some of the territory where Jesus used to take his disciples away on times of retreat. Our first stop was the dramatic first-century town of Gamla. Built on a rocky promontory with steep valleys on both sides, Gamla was designed as a town that could be defended like a fortress. Perhaps the strongly nationalistic residents remembered what the Romans had done to populations that did not submit to their rule and they were determined to resist the might of Rome. When the Jewish Revolt broke out in 66 AD, Gamla quickly became a stronghold of the Zealot rebels, so it is no surprise that Vespasian's Roman army attacked the city within the first year of the revolt. They undermined a tower, breached the city wall and slaughtered the inhabitants or drove them to suicide. After a strenuous hike down the saddle of the hill, we climbed to the top of the main defensive tower of the city wall for an overview of this dramatic site. 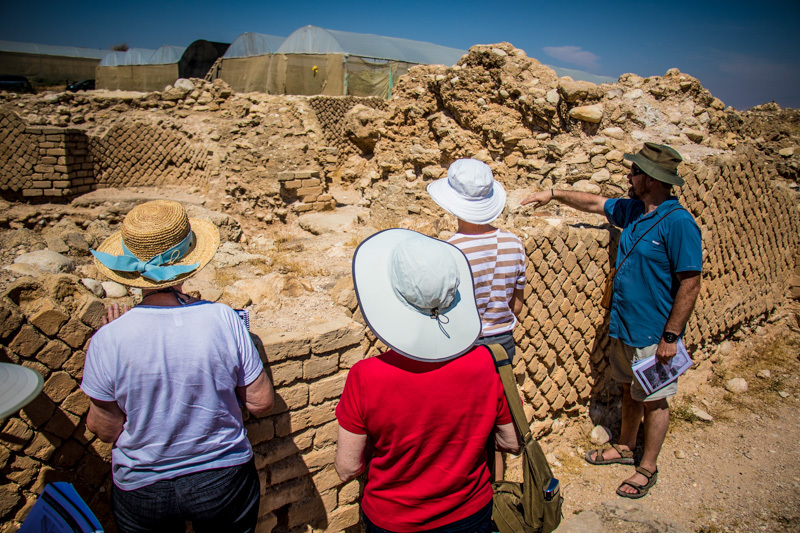 Of greatest interest to those who follow in the Footsteps of Jesus, Gamla boasts ruins of the oldest and largest first-century synagogue uncovered so far in the Holy Land. It was amazing to sit on the stepped seats and wonder if Jesus' preached in this very place as part of his travels which the Gospel writers tell us included every town in Galilee! From Gamla we headed further north to the ancient site of Banias which was called Caesarea Philippi in Jesus' time. 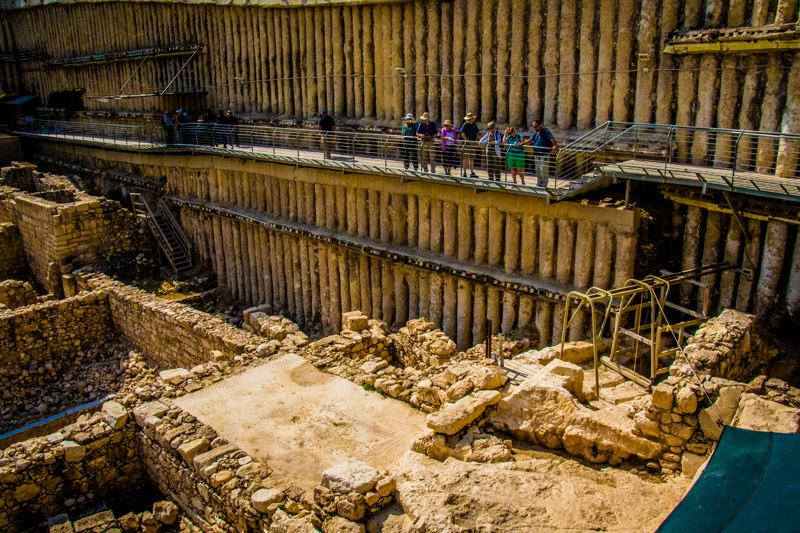 This was a major site of pagan worship which Herod's son Phillip had made the capital of his territory. From a large cave dedicated to the god Pan, flowed a powerful spring that is still the source of the Jordan River. It was here that Jesus took his disciples on a retreat and asked them that all important question, "Who do you say that I am?" By virtue of divine revelation Peter exclaimed, "You are the Messiah, the Son of the living God." When we hiked down to the nearby waterfall, the largest and most beautiful in this part of the middle east, it was easy to imagine why Jesus would bring the disciples here for a time of refreshment. It was a reminder that we need intentional times of abiding where we can be refreshed and be more receptive to God's revelation.